The explosion blew the lid off the 30-foot-high tank, fatally injuring a contract worker who was on top of the tank. A second contract worker on the tank was severely injured. CSB investigators commissioned laboratory testing of the stickwater and found telltale signs of microbial activity in the samples, such as the presence of volatile fatty acids in the liquid samples and offgassing of flammable methane and hydrogen sulphide. The stickwater inside of the storage tank had been thought to be nonhazardous. No combustible gas testing was done on the contents of the tank before the hot work commenced. 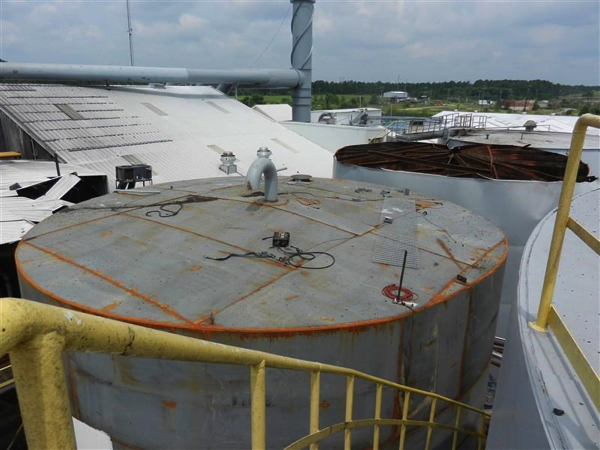 This tragedy underscores the extreme importance of careful hot work planning, hazard evaluation, and procedures for all storage tanks, whether or not flammable material is expected to be present. Hot work dangers are not limited to the oil, gas, and chemical sectors where flammability hazards are commonplace. The CSB has now examined three serious hot work incidents—all with fatalities—involving hot work on tanks of biological or organic matter. At the Packaging Corporation of America (PCA), three workers were killed on July 29, 2008, as they were performing hot work on a catwalk above an 80-foot-tall tank of “white water,” a slurry of pulp fiber waste and water. CSB laboratory testing identified anaerobic, hydrogen-producing bacteria in the tank. The hydrogen gas ignited, ripping open the tank lid and sending workers tumbling to their deaths. On February 16, 2009, a welding contractor was killed while repairing a water clarifier tank at the ConAgra Foods facility in Boardman, Oregon. The tank held water and waste from potato washing; the CSB investigation found that water and organic material had built up beneath the base of the tank and decayed through microbial action, producing flammable gas that exploded. Mixtures of water with fish, potatoes, or cardboard waste could understandably be assumed to be benign and pose little safety risk to workers. It is vital that companies, contract firms, and maintenance personnel recognize that in the confines of a storage tank, seemingly non-hazardous organic substances can release flammable gases at levels that cause the vapor space to exceed the lower flammability limit. Under those conditions, a simple spark or even conducted heat from hot work can prove disastrous. I urge all companies to follow the positive example set by the DuPont Corporation, after a fatal hot work tragedy occurred at a DuPont chemical site near Buffalo, New York. Following CSB recommendations from 2012, DuPont instituted a series of reforms to hot work safety practices on a global basis, including requirements for combustible gas monitoring when planning for welding or other hot work on or near storage tanks or adjacent spaces. Combustible gas testing is simple, safe, and affordable. It is a recommended practice of the National Fire Protection Association, The American Petroleum Institute, FM Global, and other safety organizations that produce hot work guidance. Combustible gas testing is important on tanks that hold or have held flammables, but it is equally important—if not more so—for tanks where flammables are not understood to be present. It will save lives.